23 April 2015 - Visually stunning. Transferring from a successful run at the Young Vic Theatre, Golem is a visually arresting, multimedia extravaganza by Theatre Company 1927. With projections, wacky costume, extreme lighting and highly stylised performances, Golem is an avant garde treat for it’s audience. A Golem is a robot companion, somewhat like a walking talking iPhone with a plethora of helpful suggestions and a penchant for Benedict Cumberbatch. Sure! Like all modern things, Golem must be updated. What happens when version 2 is unleashed on the world? 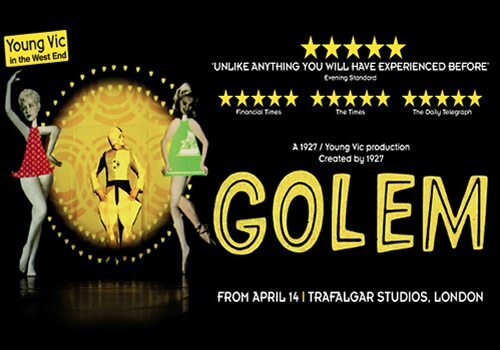 Transferring from the Young Vic after a hugely successful run, Golem now arrives at the Trafalgar Studios for 5 weeks. Golem is not aimed at children however youths aged over the age of 12 may enjoy the show if accompanied by an adult.